Serverless computing refers to a model where the existence of servers is entirely abstracted away. Even though servers exist, developers are relieved from the need to care about their operation. They are relieved from the need to worry about low-level infrastructural and operational details such as scalability, high-availability, infrastructure-security, and other details. Serverless computing is essentially about reducing maintenance efforts to allow developers to quickly focus on developing code that adds value. Serverless computing simplifies developing cloud-native applications, especially microservice-oriented solutions that decompose complex applications into small and independent modules that can be easily exchanged. Serverless computing does not refer to a specific technology. Instead, it refers to the concepts underlying the previously described model. Some promising solutions like Apache OpenWhisk have recently emerged that ease development approaches used in the serverless model. IBM Cloud Functions is a Function-as-a-Service (FaaS) platform on IBM Cloud, built using the Apache OpenWhisk open source project, that allows you to execute code in response to an event. 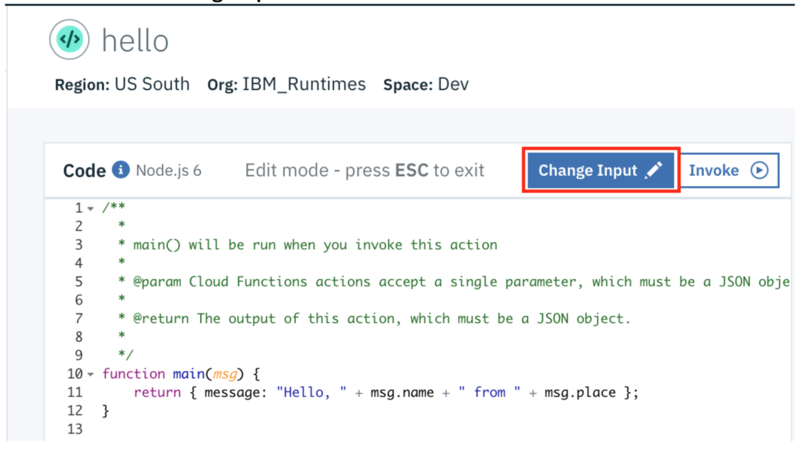 This tutorial walks you through the steps required to create, build, and run a serverless application using IBM Cloud Functions. Completing this tutorial should take about 45 minutes. If you have an existing IBM Cloud account, skip to the next section. For the steps in this tutorial, you need to create a free trial account on IBM Cloud. The instructions in this tutorial do not incur any additional costs. Create an IBM Cloud Trial account at https://cloud.ibm.com, and click on Create a Free Account. Complete the registration form with your details and a valid email address. Confirm your registration by accessing your email and clicking Confirm Account. Click Login and enter your email and password. You see the Dashboard, which is emptly because you have not created any services or apps at this point. Note the Region, Cloud Foundry Org and Cloud Foundry Space settings. Typically the settings are US South, the same as your email address, and, by default, you are placed in a space called dev, as shown in the following screen capture. There are two main options to get started with Cloud Functions. 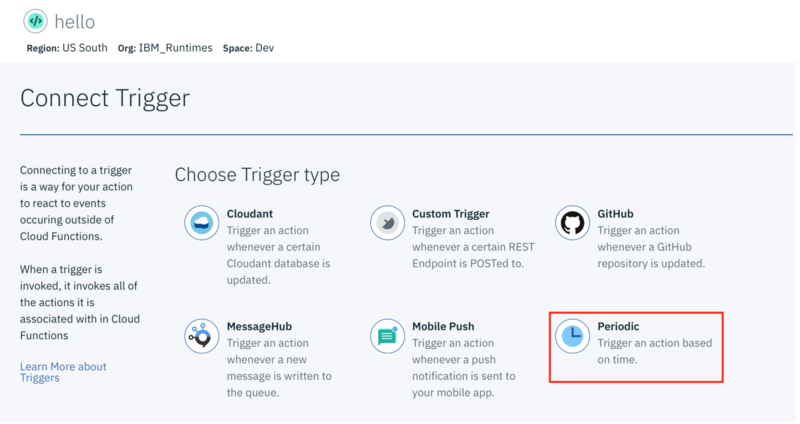 With both, you work with basic Cloud Functions entities by creating, updating, and deleting actions, triggers, rules, and sequences. With the command line interface, you perform these basic operations from the shell. With the Cloud Functions user interface, you perform the same operations from your browser. This tutorial uses the browser user interface. Log in to IBM Cloud: https://cloud.ibm.com. 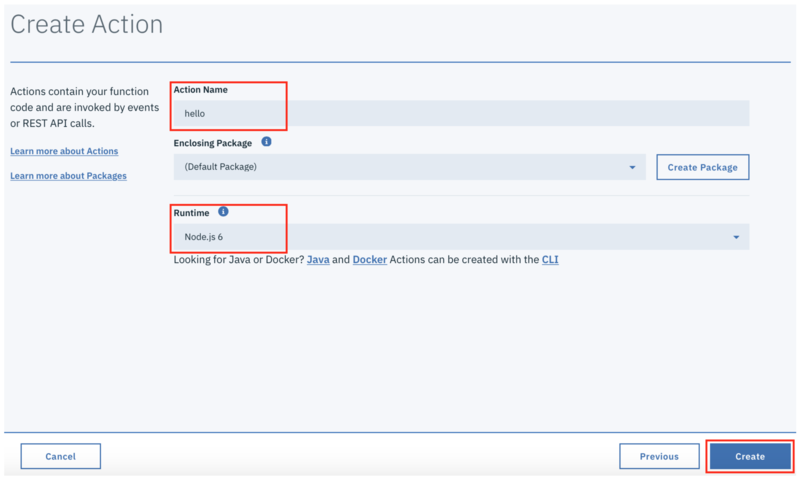 Click Functions to access the cloud-native development experience on IBM Cloud. a. The Actions section lists all actions you previously created. Clicking an action loads its code into the code editor. Hovering over an action gives you the option to click a trash icon to delete the action. b. the Triggers section lists all the triggers you previously created. Hover over a trigger to view a flash icon, which you can use to fire the trigger, and a trash icon, which you can use to delete the trigger. c. The Monitor section displays information about your actions and their activity, including an activity summary and timeline. d. The Logs section open the Logging service, which you can use to collect, analyze, and build dashboards for your logs. Enter an action name, for example, hello, and select Node.js 6 for the runtime environment. Leave everything else as is and click Create. "message": "Hello, Andreas from Stuttgart, Germany"
* Events can be emitted by services, like other services that are part of the IBM Cloud platform. These services have triggers that represent a named channel for a stream of events. * Events can be emitted in the form of API calls, fired by standard web or mobile applications, which can then trigger actions. So far, you have only triggered actions manually. Now, try triggering actions another way: periodically. This action returns the time and the frequency of times invoked. A counter is used as a global variable to maintain the count. Because it is a global variable, it persists across invocations of the same action. Next, click Connected Triggers to add a Trigger that causes the action to be run. Give your trigger a name (for example, minute alarm), scroll down to UTC Minutes, and select Every Minute from the list. Click Create & Connect to create the trigger and connect your action to it. Click <- Actions to return to the dashboard. 4. Create a web action. Congratulations! You successfully built and deployed several serverless Cloud Functions, including web actions that can be invoked from the browser or from microservices – all from inside a browser. Now you can try these steps with your own code. Experiment some more with running a cloud-native serverless app written in Node.